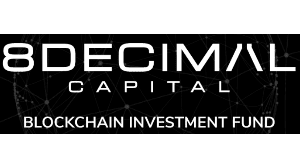 8 Decimal Capital is a blockchain venture capital fund based in Palo Alto, CA. They have been an active investor in blockchain companies such as Bluzelle, EOS, 0x, Icon, and Libra Credit Network. Want more detailed information on 8 Decimal Capital and more than 700 additional crypto hedge funds and VC funds? Download the Crypto Fund List! Want more detailed information on 8 Decimal Capital? Get 30+ categories of information on 8 Decimal Capital and more than 700 crypto hedge funds and crypto VC funds in the crypto fund list.